Acute injury occurs from a known or sometimes unknown incident. Signs and symptoms develop rapidly. 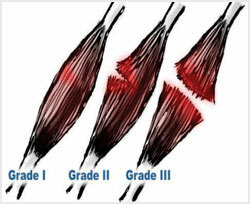 Chronic injury occurs as a result of repetitive friction, pulling, twisting or compression that develops over time. Signs and symptoms develop slowly with inflammation, pain. In pre-clinical study, UCB CD34 cells were injected into nonischemic adductor muscles in mice. The results showed that CD34 cells enhanced the number of arterioles in nonischemic muscles to a level comparable to that achieved in ischemic condition. Umbilical cord tissue provides a unique source of cells with potential for tissue repair. Human umbilical cord cells demonstrated excellent growth properties representing a new, readily available cell source for tissue engineering.